Mix the ingredients in a spray bottle. Spray the oven with this mixture. Wipe away. Rinse with clean water. Note: the mixture needs to be rinsed well or it will leave a white residue. Pour plain club soda (not the low-sodium kind) into a spray bottle. Spray it on glass or mirror. Use a lint-free cloth or paper and wipe until it’s clean. Add the ingredients to a large bowl. Microwave uncovered for 3 minutes on high. Leave for another three minutes. Open the microwave, remove the bowl and wipe down the inside of the microwave with a clean damp cloth. 10 drops tea tree essential oil (optional). Pour the ingredients slowly into the toilet bowl. Leave it for 15 minutes then scrub. Mix ingredients in a spray bottle. Spray the shower wall and tub. Let it sit for at least 1/2 hour. Rinse it off. If you need extra cleaning power, use liquid detergent and a nylon or plastic sponge. Avoid soap, which can leave a residue. If there are rust stains in your tub, mix a bit of cream of tartar with water until the consistency is like toothpaste. Put a little on the stains and use a sponge to wash off. 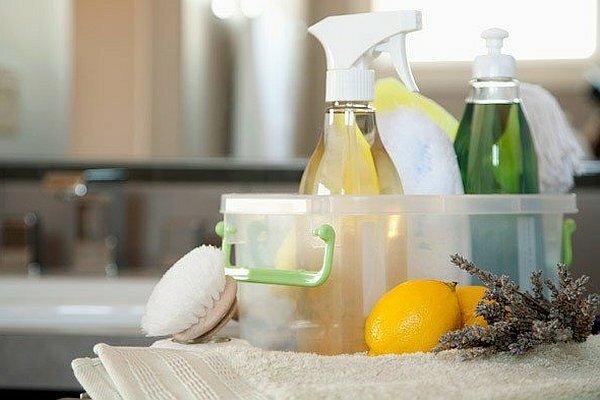 Don’t mix homemade cleaners with store-bought or other homemade cleaners. Use the same precautions as with store-bought cleaners – keep them out of reach of children and pets. If using unmarked bottles and containers, make sure to label them. Don’t use food containers to mix cleaning products. Next articleDiner En Blanc Victoria Happens June 23, 2016… But Where?